Steaming corn on the cob is one of the easiest and most delicious ways to cook corn. It only requires two ingredients: corn and water. The steaming process also enables the corn to retain all of its nutrients. You will need a steamer basket and pot to use the standard steaming method. If you don't have a steamer basket, alternative methods are listed using your microwave, skillet, or oven. Husk the corn and remove the silk. Trim off any discolored kernels or any that have been damaged by insects. Depending on the size of your steamer basket, you may need to cut the ears of corn in half so they are short enough to fit. Add 2 inches of water to a large pot and insert a steamer rack. Make sure the water is not touching the bottom of the steamer rack. If it is, pour off some of the water. Cover the pot and place it over high heat bringing the water to a boil. When the water begins to boil, place the corn into the steamer basket inside the pot using a pair of tongs. Re-cover pot and let the corn steam for 4 minutes or until it becomes a deep yellow. At this point, the corn will be crisp. If you prefer your corn to be less crisp, steam it for 7 minutes. For even softer corn, steam it for 10 to 15 minutes. The longer you steam the corn, the more attention you must pay to the level of the water in the steamer. Don't let it fall lower than 1 inch or it may run dry and scorch your pot. Turn off the burner and carefully remove the corn from the pot with tongs and serve as is or with butter and salt. Choose young, ​freshly picked corn and savor its sweetness and tenderness. One critical piece of advice is that you should never salt the water or the corn before you cook it. Salt will toughen the corn. Save the salt and butter for seasoning the corn after it has been steamed. A critical number to keep in mind is 4 minutes. That is the best steaming/cooking time for a cob of corn, producing kernels that are still crisp and sweet but are cooked. If you don't have a steamer basket but you would like to use a steaming method rather than boiling your corn in a big pot of water, try these methods. Heat 1 to 2 inches of water in a skillet to boiling. Add the shucked corn cobs to the water. Return it to a boil, lower the heat, and cover the skillet with a lid. Steam for 4 minutes or until it is bright yellow. The drawback of this method is that some of the nutrients will be boiled out in the water. With a large skillet, you may be able to steam three or four ears at a time. Heat your oven to 400 F. Shuck the corn and cut it in half if needed. Place it in a bowl or casserole dish with 1/2 inch of water. Cover the dish with aluminum foil and bake it for 30 minutes. With this method and the right size of dish, you can steam multiple ears of corn at the same time. You can steam corn on the cob in the microwave in two ways. The easiest way is to place the cob in the microwave without husking it or trimming it. Microwave on high for 4 minutes. Remove it from the microwave using tongs or an oven mitt. Trim the bottom of the ear (not the top where the silk attaches). Shake out the cooked cob of corn by grasping the top end. This should release the cooked cob of corn and retain the silk. The drawback is that you can only cook one cob at a time with this method. 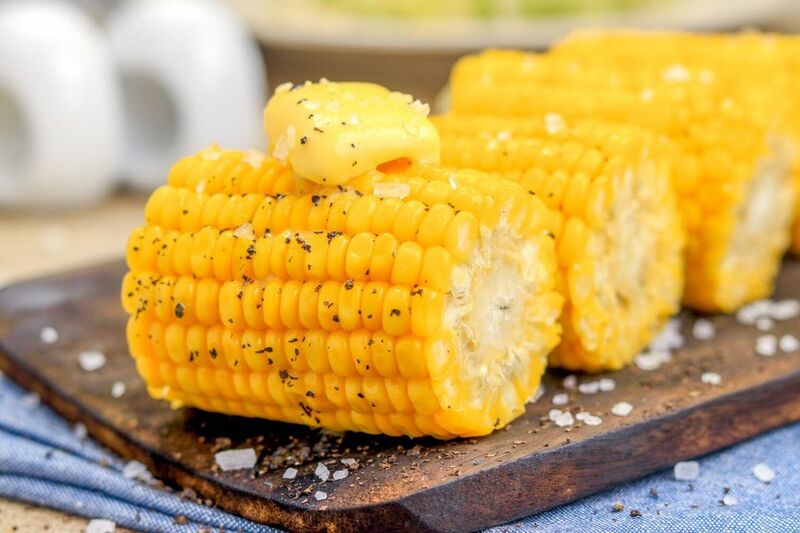 Another way to steam a cob of corn in the microwave is to shuck it, cut it in half, and place it in a bowl or dish with a couple of tablespoons of water. Cover the dish with plastic wrap and microwave on high for 4 to 6 minutes until bright yellow. You can microwave a couple of cobs of corn at a time using this method, increasing the time and microwaving until they are bright yellow.